Unvented Gas Logs utilize new burner technology and a high burn temperature to keep the carbon monoxide levels down to an acceptable level. These use indoor air for combustion, do not need a chimney, do not exhaust anything to the outside and keep all of the heat in your home. 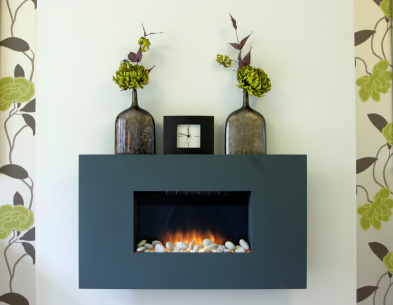 Ventless Gas Fireplace with rocks instead of logs. Because there is no vent, flue, or chimney required, all of the heat generated by the product goes directly into the home. That’s why vent-free products are 99 percent energy efficient! Unvented (or Ventless) systems have Oxygen Depletion Sensors, which shut off the gas flow if the oxygen level drops to unsafe levels. The safety pilot is designed to stop the flow of gas if the pilot flame goes out. The Oxygen Depletion System or O.D.S., is designed to shut down the unit if the oxygen level drops below 18.5%. However, it is a good idea to install a carbon monoxide alarm in every home, regardless of the appliance installed. Home related CO incidents are caused by many sources; some examples are automobiles in attached garages, portable grills or hibachis used indoors, and malfunctioning gas appliances. Whether vented or un-vented, follow the manufacturer’s instructions, and maintain all gas appliances.